Glass is one of the pivotal materials which are used throughout different ages in home furniture to add special effects. Mirrored furniture is available in various sizes, colors, and styles to match all the needs and tastes. 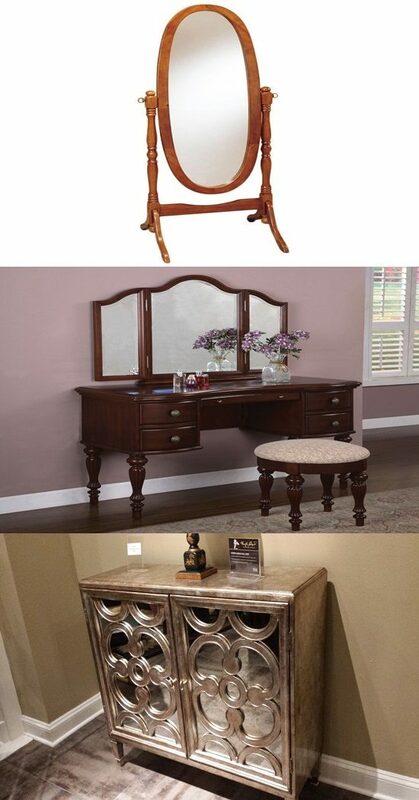 You can manipulate these three variants to give a distinct period feel to your home. You can go for the antique luxury of the Victorian style or the simple modern style, or you can mix and match to get any period style in between. First, let’s take the shabby chic style as an example to go back to the past. Mirrored furniture of this style should have a worn and aged look. Concerning the size, antique items are huge and enormous that the paragon of this style fits only large apartments and villas. Vintage items are usually in bold colors like the distressed white and dark wood. What really features such antiques is the intricacy and craftsmanship of carvings. So, you can get large mirrors with dark edges, ornate frames, and distressed patches. For example, a white large-mirrored dresser with an elaborate frame will give you a classic look. Also, the antique carved walnut mahogany wardrobe or armoire gives an ancient-looking bedroom. The mirrors of this item can have beveled edges and ornately carved wooden panels to give an amazing, impressive look. Moreover, hang large distressed white- or dark-edged mirrors with gold or silver carvings of cherubs, beautiful women, ducks, flowers, or the Man in the Moon theme in your guests’ room to give an awesome, stunning look. The second period style of the mirrored furniture is the modern. Such furniture pieces are far from massiveness and heaviness; they save space as much as possible to fit small apartments, in specific. As for coloring, modern mirrored furniture is available in neutral colors like subtle wood, beige, or cream. But, the shining white and espresso colors also look modern and chic. Modern mirrored furniture tends to the beauty of simplicity and smoothness, so glass blended with chrome can give the perfect look. You can furnish your bedroom, living room, dining room, and bathroom with such items. To illustrate, the mirrored dining, coffee, console, or bedside tables and the mirrored bathroom cabinets give a bright, unique effect. Also, mirrored wall cabinets and bookcases with candles on both sides will give you a romantic, relaxing atmosphere.